We will talk about real life, scary violations that can cost companies like yours thousands of dollars in lawsuits. We will also offer easy solutions that you can implement to prevent these problems. Featured Presenter: Cory Kuhlenschmidt, Partner at Bamberger, Foreman, Oswald & Hahn, LLP Cory Kuhlenschmidt works with company owners, executives, and human resources personnel to understand and navigate the complexities of employment law, including discrimination and harassment laws, the Fair Labor Standards Act, ADA compliance, the FMLA, healthcare reform legislation, and more. An end to the terror is in sight as we explore Post-Offer Employment testing: Physical Demand testing vs. Medical Physicals. We will address how to be proactive and prevent unnecessary workers’ compensation claims by ensuring that your workforce is physically qualified for the job. Featured Presenter: Dr. Verlinda Henshaw, OTD, MS, OTR/L Dr. Henshaw is an Occupational Therapist specializing in industrial rehabilitation and orthopedic injury management and owner of Occupational Performance and Rehab. OP&R is an outpatient Occupational and Physical Therapy company that has developed Ergo-First a “No-Lost Time Program”. Welcome to The Tedrick Group's new online home! We like to think of this site as just another extension of our risk-reducing philosophy. More than a new look, we've added fuller descriptions of our products and services as well as helpful links to industry standards and institutes. We've also placed the client logins you've come to rely upon conveniently at hand. No matter where you are on our site, you'll find our 3 login portals at the top right of the page. Don't forget to check back to this news box for helpful tips and updates we'll be posting each month. We hope you'll find this site useful as you continue to walk the proactive walk. Got feedback, questions or suggestions? We'd love to hear from you. How will the new healthcare laws affect you and your business? This symposium is in response to questions from business owners on how the recent legislation will affect their health insurance benefits, taxes and business operations. We will address Risk Management and what every employer should be considering when purchasing Healthcare. The most commonly asked questions will be answered and the session will be interactive, providing answers to the unique questions of attendees. Mark has over 16 years of Managed Care experience and has been with HealthLink since 2003. His experience is in Sales, Network Development, Network/Data Consulting, and Network Management. Prior to joining HealthLink, Mark worked for a third party administrator in operations, developing and managing HealthSCOPE’s proprietary and rental networks. Mark earned his bachelor’s degree in Business Administration from the University of Missouri St. Louis. Heath has over 15 years experience in the employee benefits industry working on consulting with agencies, insurance companies, and Third Party Administrators on the sales and implementation of products, marketing, strategies, and distribution. Heath has been successful in the deployment of specialized products within hospitals, agencies and Third Party Administrators and achieved significant growth in each of these segments throughout his career. Heath joined the executive team at Key Benefit Administrators in ‘07 and is currently deploying these creative and unique strategies in his position at Key Benefit Administrators. Heath is a graduate of Denison University in Granville, OH. Seminar attendees learned how to take advantage of this great opportunity to direct their injured workers into a “WCPPP”. The final rules just became effective March 4, 2013. The WCPPP allows Employers to control direct care of employees who have had a workers comp claim. This will reduce medical costs, which in turn, will help reduce Experience Modification Factors. Bottom-line – this will reduce Workers’ Compensation costs for your business. David E. Kolb, President/CEO of HFN, Inc. The National Council on Compensation Insurance (NCCI) announced its plan to increase the primary-excess split point over a three-year transition period. The first stage of the transition will take effect with each state’s approved rate and loss cost filing on or after January 1, 2013. This experience rating plan change (filing E-1402) may have a greater adverse impact on some employers than any change made in the plan in decades. Learn more! Through this event and our regular services, we can help if you would like to save at least 30% on workers’ comp medical expenses AND exercise more direct control over your employees’ medical treatment! An exciting new Illinois law allows you, for the first time ever, to DO BOTH by participating in a Workers’ Compensation Preferred Provider Program (WCPPP). In honor of the New Year, the Tedrick Group will be closed Monday, December 31st and will reopen at 8am on Wednesday, January 2nd. Stay Happy and Avoid the FLU! The Tedrick Group is Hosting a Free Flu Shot Clinic on October 17th starting at 10 AM at the Tedrick Group office in Mount Vernon, IL. Available free of charge to all clients, employees, spouses and dependents. No appointment necessary. Please consider taking advantage of this service. Walgreens Pharmacists will administer the shots. Forms will be available at the time of your arrival. In observance of Independence Day the Tedrick Group will be closed on Monday, July 4th. Thank you for your business and on behalf of our entire company we wish you a safe and happy holiday weekend! Happy Thanksgiving! We hope you have a wonderful day celebrating all there is to be thankful for. The Tedrick Group will be closed November 22nd and 23rd for Thanksgiving so that we may spend valuable time with family and friends. We wish you all a safe and happy Thanksgiving holiday! 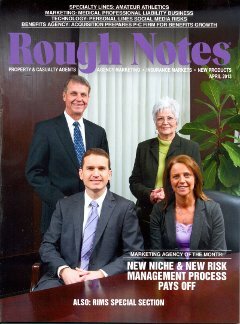 This month, The Tedrick Group is the cover story for Rough Notes magazine, the industry's longest running publication. The feature details the transition to our current business approach and highlights several of our key team members along the way. The sum: clients have experienced considerable risk reduction with improvements in productivity and profit, resulting in our own growth of 20%. Click here to read the full article online at Rough Notes.